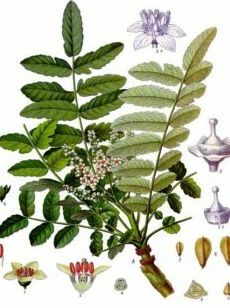 Boswellia is a large branching tree found in the hills of India. The extract of the gummy resin is used in herbal medicines. It has long been known to be a potent anti-inflammatory, antiarthritic, and a pain reliever without any side effects. The gum and oil also are used in cosmetics, perfumes, and skin care products. The main component is the resin which is used in herbal therapies. Many studies have been done on this, most of them in India as it is an ayurvedic herb. It has been studied and shown to be effective in asthma and colitis. Unfortunately, there are mixed results clinically when it was looked at for arthritis which is where it is traditionally recommmended. This herb has also been studied for other inflammatory conditions such as Crohn's disease, unfortunately the results were not good and it showed no benefit against the condition. One small study showed that Boswellia may reduce swelling in the brain that occurs after brain tumor patients have surgery and subsequent radiation. One of the nice thing is that it has not shown to have adverse effects. Arthritis. The active components deactivate the hormonal triggers for inflammation and pain in osteoarthritis. Stimulates the growth of cartilage, increases blood supply to joints. Dry, mature skin. Rejuvinates skin by encouraging new cell growth. Helps oil production in dry skin. Ulcerative colitis. May be helpful in UC. 400mg 3 times daily. Full effect may take up to 1-2 months. Asthma. Follow directions. May reduce asthma attacks. Psoriasis. No studies yet to support benefits, but may decrease hypercellular skin growth. Boswellia stimulates blood circulation therefore, should not be used during pregnancy. Should not be taken if you have liver or kidney disease. Is not suitable for children. Occasional side effects include diarhhea, rash and nausea. One of the benefits of Boswellia is that it does not cause gastric ulcers, so it can be taken on a daily basis. When using it for colitis, recommendations are to take 400mg three times a day. Avoid financial headaches. Find out how to make money with a site like this.